University of North Carolina Press, 9781469632421, 352pp. In this insightful and eclectic history, Adrian Miller delves into the influences, ingredients, and innovations that make up the soul food tradition. Focusing each chapter on the culinary and social history of one dish--such as fried chicken, chitlins, yams, greens, and "red drinks--Miller uncovers how it got on the soul food plate and what it means for African American culture and identity. Miller argues that the story is more complex and surprising than commonly thought. Four centuries in the making, and fusing European, Native American, and West African cuisines, soul food--in all its fried, pork-infused, and sugary glory--is but one aspect of African American culinary heritage. 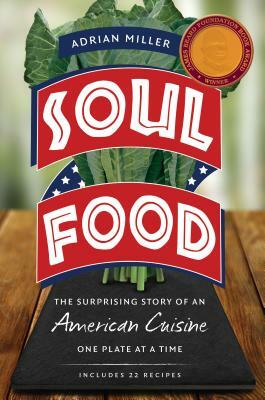 Miller discusses how soul food has become incorporated into American culture and explores its connections to identity politics, bad health raps, and healthier alternatives. This refreshing look at one of America's most celebrated, mythologized, and maligned cuisines is enriched by spirited sidebars, photographs, and twenty-two recipes.